Fiction – paperback; Penguin Modern Classics; 240 pages; 2010. A novel set in a nursing home doesn’t exactly sound like a barrel of laughs, but in the very capable hands of Australia’s grand dame of letters, Elizabeth Jolley, it’s actually a wonderful black comedy in the tradition of One Flew Over the Cuckoo’s Nest. Jolley, who died in 2007, wrote 15 novels. 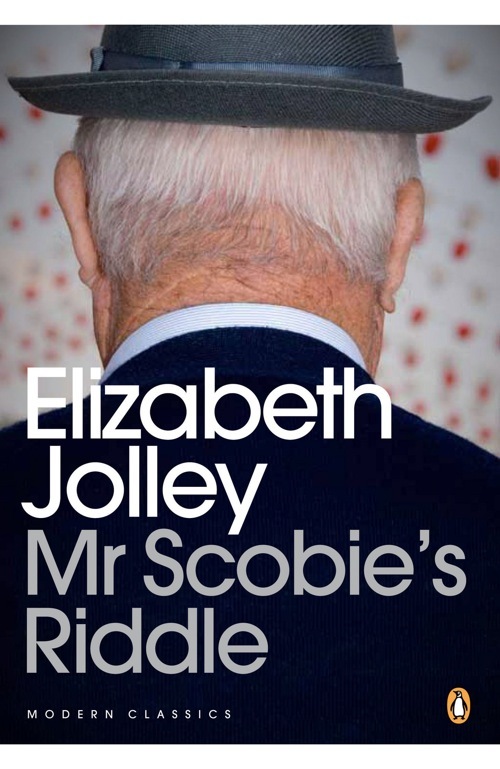 Mr Scobie’s Riddle, her fourth, was published in 1983 and won the Age book of the year that same year. It has recently been reprinted in the lovely Penguin Modern Classics livery I love so much. Mr Scobie of the title is an 85-year-old retired music teacher, who is admitted to St. Christopher and St. Jude, a rather dubious nursing home presided over by Matron Hyacinth Price. Matron isn’t exactly Nurse Ratched, but she does have her eyes on her patient’s worldly goods and cons them into signing them over. As she battles to keep the home from falling into bankruptcy she has other problems with which to contend: her cook has a raging temper and a penchant for swearing loudly, her night nurse won’t follow instructions, and she struggles to find — and keep — female staff. To complicate matters further, her housekeeper has married her bigamist husband, and now she’s hiding him in the caravan out the back. Oh yes, this is all ripe for farce. And then there’s the patients. Miss Hailey, who’s just 60 years old, is a nutty writer who’s penned a novel rejected by more than 40 publishers and a poem branded “indecent” by the Town Clerk. Mr Hughes is a retired Welsh farmer who has problems with his bowels. And Mr Privett writes an advertisement selling his body for a “reasonable price”. Throw in all-night card games, female staff who gossip like schoolgirls, and patients who make bids for escape, and it’s clear that Jolley’s created a rather funny novel. But she treads a very fine line between comedy and pathos, and only a blinkered reader would miss the social commentary that runs throughout this novel. Ms Jolley has a lot to say about the lack of respect society has for those we brand “old folk”. We see this via Mr Scobie’s abject misery at having to give up his lovely house and land at Rosewood East. Indeed his riddle — that death is the only certainty in life — isn’t as funny as it might sound. This is a man who hankers for the past because he knows there is no future. Not even his nephew, a burglar on the run, and his niece, who has settled for an unsuitable man, give him any cheer. Instead, he’s locked up in a house full of “evil people” with whom he has nothing in common but age. Any wonder he tries to escape? I went through a whole gamut of emotions as I read Mr Scobie’s Riddle. I laughed, I got angry, I tried not to cry. It’s a truly poignant novel peopled with a cast of characters that feel very human despite their eccentricity. I loved this book, and think it deserves a re-read if only to pick up on all the gentle nuances I missed first time round. Please note that the Penguin Modern Classics edition is only available in Australia, but if you live in the UK you should be able to pick up older secondhand editions for just a pound or two online. It will be money well spent. Sounds fantastic, thanks for posting this. I’m off to Amazon marketplace now (ducking under my book-buying embargo as it flies out the window). This sounds like a marvellous book, and I do like books set in old people’s homes and nursing homes (which could be considered a little bit odd ha) because the dynamics of characters in such a weird and unnatural enviroment – which is what it is – can make for some interesting relationships and the like. I also like the fact you said it took you through a whole mixture of emotions. Its interesting, isnt it, that we can dump old people into a strange and unfamiliar environment, akin to a boarding school, and just expect them to put up with it. Mr Scobies really detests the two other chaps in his room and he really cant make head nor tail of Miss Hailey, who is a complete nutter and keeps coming into his room with her dressing gown undone! Anyway, its a great book. I neglected to mention that some of it is written as notes swapped between the matron and the night nurse, and they are hilarious, if only because the night nurse cannot spell to save herself! I could never last much longer than a month or so without buying a book, Kirsty. Hope you find a copy of this, and enjoy it as much as I did. Its funny and touching, and not many books can achieve that as well as Ms Jolley. Isn’t the cover great? I love Penguin Modern Classics. Really annoying it isn’t easily available in the UK. I’m so glad you liked this kimbofo. As you (probably) know, Jolley is one of my favourite writers (and one of the three so far I’ve written up on my blog). One of the things I like about her is her dark humour – and you’ve mentioned that here. I haven’t read this particular one, but I sure would like to. Sounds like a very good read. I’ll be adding it to my list of books to buy/read/scrounge/mooch. Shame that it’s not available in this edition in the UK. Why is that, I wonder? Have you read her semi-autobiographical trilogy? I started reading The George’s Wife and then realised it was the third part of the trilogy, so have put it aside as I think I need to read the other two first. But… they seem to be only available in Oz. Grrr. So, am compiling a little list of books I need to buy from Readings and may do a little splurge closer to my birthday! Yes, it’s a great picture. This edition may eventually appear in the UK… I’ve noticed some of the Oz-only versions do get published here eventually, for example, The Shiralee. This book sounds great. What an eye-catching copy too. I loved Muriel Spark’s Memento Mori because it had many of the elements that you mention in your review. Definitely one for me to look out for in future. I really ought to read Memento Mori because Ive only ever heard great things about it. I think I’m slowly but surely falling in love Elizabeth Jolley. She writes so sneakily and effortlessly builds up the atmosphere. This sounds like a great read. Is Penguin republishing most of Jolley’s books? She is quite difficult to find except for ‘The Well’.